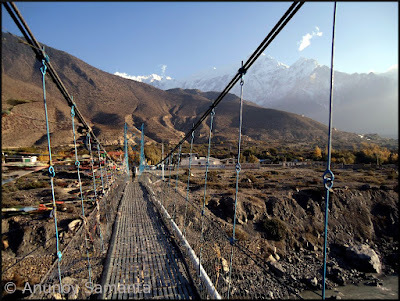 This is the concluding part of my Jomsom to Muktinath Trekking Tale. In case you missed its previous installments, click here to read the Part 1 and Part 2 of this series. If you have a genuine paucity of time, for you I'll summarize the story so far. In October, 2011, I along with two of my colleagues, responded to the call of mystic Mustang and traveled to Jomsom from Pokhara. 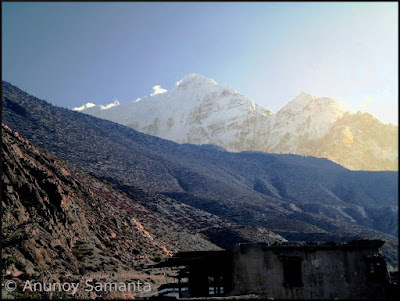 Our first morning at Jomsom turned out to be cursed by cold northern wind. It was difficult to stand even for a minute on the terrace to observe the panorama of barren rocky mountains and snowy Dhaulagiri. 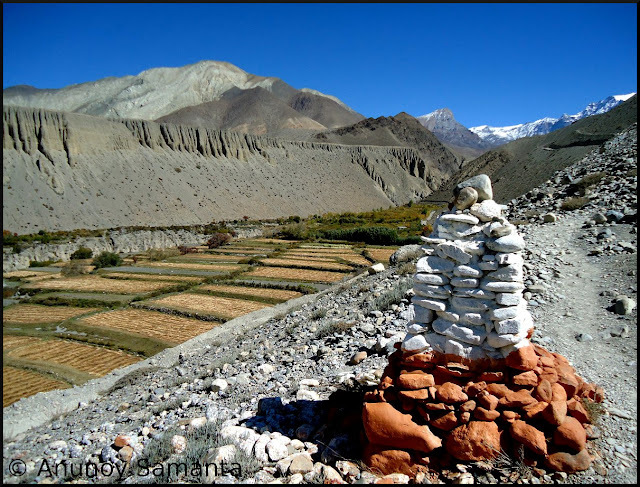 Undaunted, we bid adieu to the quivering colored flags and orange stacks of corns on the surrounding flat wood piled rooftops and prepared to trek to Muktinath, an important pilgrimage place for both Hindus and Buddhists. Our aim was to climb more than 1,000 meters in a single day. A couple of kilometers before we reached Muktinath, I was hit by acute mountain sickness. Luckily, we came across a jeep which took us to a tea-house at the holy village. In the stillness of the night at 3,800 meters I kept on tossing on a bed with dust coated skin, light head and ‘120 plus’ heart rate for the next twelve hours! Our aim was to climb more than 1,000 meters in a single day. We felt better the following morning (Day 3), although not completely recovered... and headed for Muktinath Darshan. Again there were few hundred meters to ascend. Muktinath is an important pilgrimage place for both Hindu & Buddhist. The holy shrine at Muktinath is in a grove of trees and includes a Buddhist Gompa and the pagoda style temple of Vishnu Temple, Containing an Image of Vishnu. 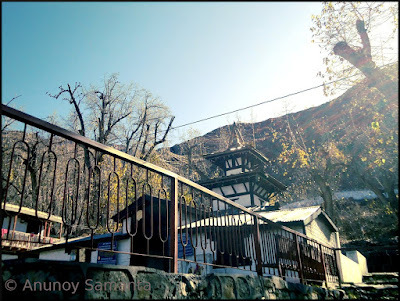 The Pagoda style Muktinath Temple is symbol of the religious symbiosis between both Hindus and Buddhists, against a backdrop of incredible starkness one can sit and stare to the south the snow covered Annapurna range, or to the north the Tibetan plateau. Hindus believe that lord Vishnu got salvation from curse of Brinda here. Therefore he is worshiped as Muktinath (the lord of salvation). 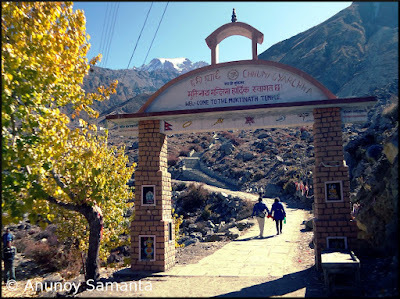 Muktinath is an important pilgrimage place for both Hindu & Buddhist. On the other hand Buddhists regard the deity as Buddha. Buddhists worships Vishnu as Avalokiteshvara. The Temple depicts metal statues of lord Vishnu, goddess Laxmi, Saraswati, Janaki, Garuda, Lava-Kush and Sapta Rishis. We somehow managed to reach the temple at the base from where one has to hike some more height to reach the temple at a greater height. There was snowfall in the top temple which we came to know. We were eager to go up but our recent AMS hadn’t forsaken us completely; so, had to give up our religious endeavor (we took it as ‘God willing’). It is believed that one should visit this temple after completing pilgrimage of four special religious sites, Chardham Yatra of India! 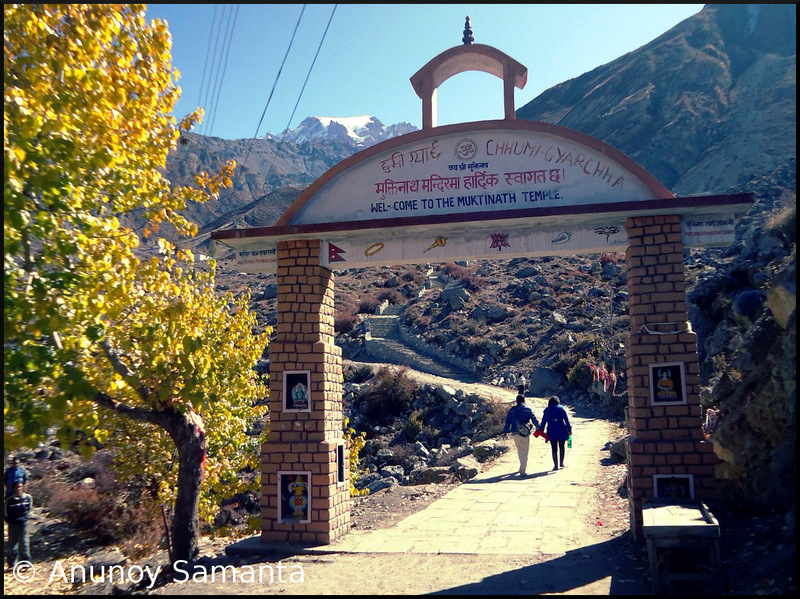 The holy shrine at Muktinath includes a Buddhist Gompa and a pagoda style temple of Vishnu. 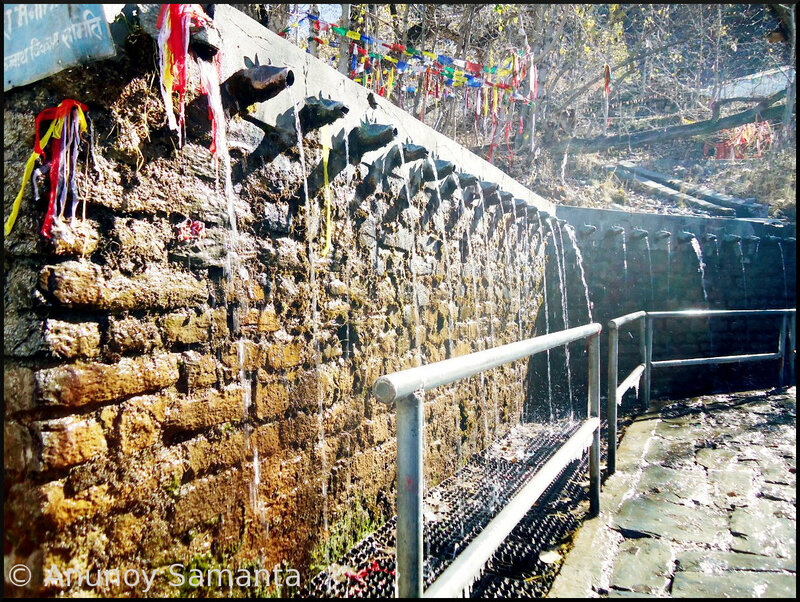 Once Pilgrimage journey made to this holy Muktinath, holy dip in the Kunda and bath beneath of 108 waterspouts “Muktidhara” is believed to bring about salvation (Moksha) and fulfill one’s wishes (but as I said earlier God had some other wishes for us, may be a ‘second visit’ some other time!). The Buddhist nuns take care of cultural heritage inside the Muktinath temple. Unfortunately, photography inside Temple and Monasteries is strictly prohibited. Another attraction for the pilgrims is the River kali Gandaki from where one can collect fossils of the prehistoric age popularly known as ‘Shaligram’. One may find such a stone within a few minutes or it may take hours and without any success. Nevertheless, these fossils can be collected from the local people at a price. Shaligram is considered sacred and is kept in prayer room in the house. It is supposed to be symbol of Lord Vishnu. Holy dip in the Kunda and bath beneath the 108 waterspouts is believed to bring about salvation in a devotee! Then we bought some woolen caps and gloves from local hand-loom artists and walked down to our lodge by 11:00 AM to checkout and head down to Jomsom on a jeep. 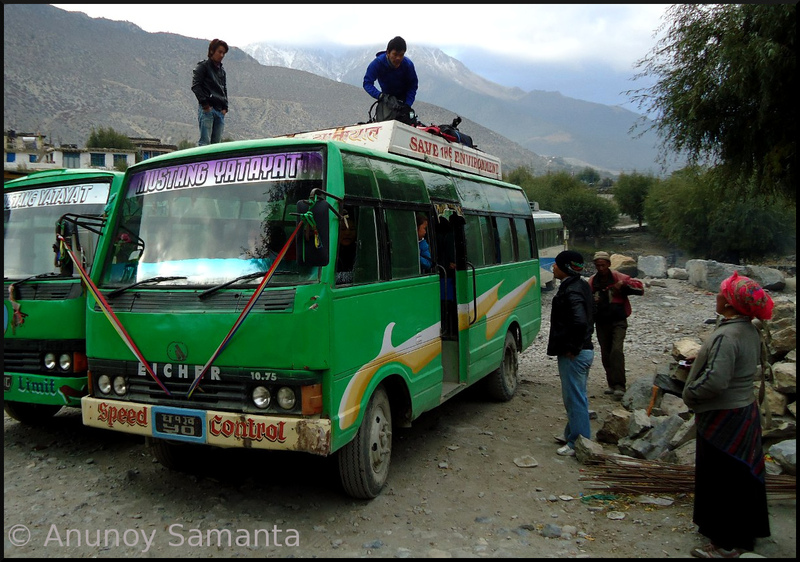 The over-packed vehicle took 1 hour and 30 minutes to reach Jomsom. Coming down to 2,720m from 3,800m gave our lungs enough relief for sure... After resting an hour in the hotel we went out to experience the town of Jomsom by 3:30 afternoon. 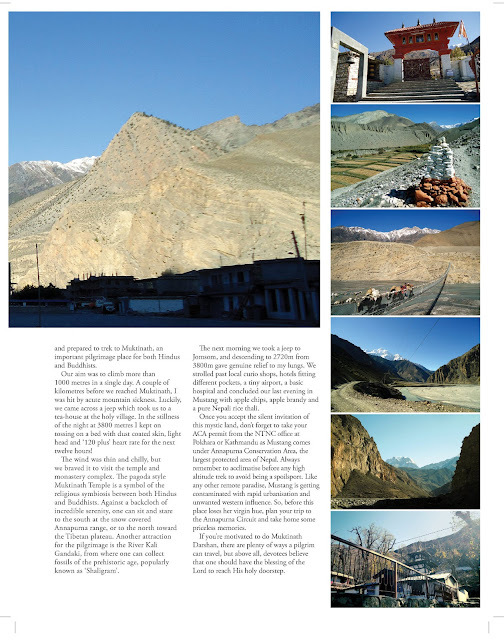 The more we walked on the stony roads of the remote town, better we felt its distinctness from the rest of the world. The ideal harmony of wildness of its climate, bareness of its soil and tranquility of its summits was an awesome evidence of Nature’s craftsmanship. The Pagoda style Muktinath Temple is a symbol of the religious symbiosis between Hinduism and Buddhism. 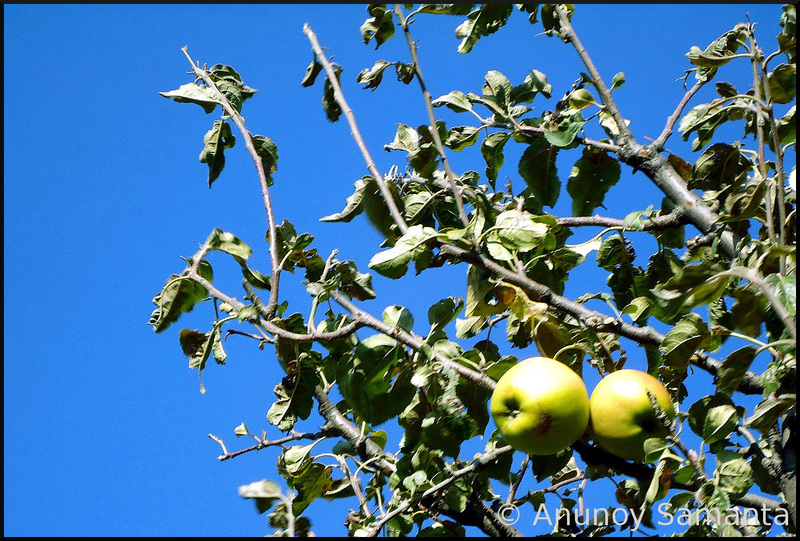 There are apple tress in everybody’s garden... Apples fall off from trees and roll on the ground like what we see with guava in plains! The airport at Jomsom has such a small runway that only a very experienced pilots can tackle. We tasted dried apple chips, local Marpha apple brandy and also bought some apples... Tibetan curio shops near the airport were too expensive to get a good deal. Hotels, lodges and home-stays are established all around the main road showing how important role tourism plays on local economy... We couldn’t miss visiting the Jomsom Hospital with its hand few beds and basic facilities... the tiny medical store outside depicted the residual melancholy about the local health resources. 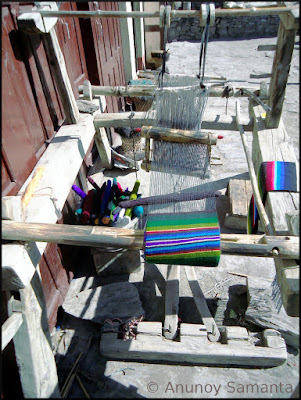 At Muktinath we bought some woolen caps and gloves from local hand-loom artists. Darkness surrounded faster than we had anticipated… It was our last night in Mustang, at least for this trip; so we decided to take Nepali food once again for dinner in some simple nameless hotel (rather say home-stay) run by a past middle aged Jomsom lady… Her blabbering while she cooked for us ‘hot & homely’ kept us wet with the aroma of Mustang and hospitality while serving us dinner acted as sauce to the plain food. Streets were blessed with either dim light or no light at all… So we returned to our hotel soon for the warmth of the wood and wool. 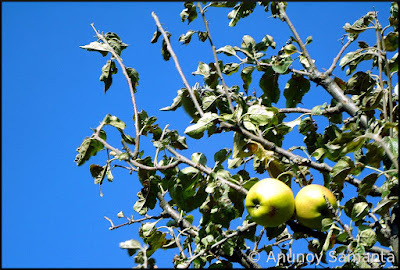 In Mustang apples fall off from trees and roll on the ground like what we see with guava in plains. Next morning (Day 4), the sky seemed slightly overcast… gulping few mugs of tea we rushed to catch the earliest morning bus of seven. The green minibus was already filled with other trekkers, travelers and hand few local people, so we were lucky to get three backseats just to experience the life of a ping-pong ball for next 3-4 hours! Our bus started its journey late and along with that it stopped in all possible halts for all possible reasons ranging from delivering boxes of apple to picking up postal sac from some remote post office, ultimately delaying our arrival at Ghasa. There also the irony didn’t leave us at our fate, for it took almost 3 hours for the next bus for Beni to depart while I passed my time crunching packets of chips, watching hundreds of passengers waiting with similar keenness and kids busy in their respective worlds. After resting an hour in the hotel we went out to experience the town of Jomsom. As the number of passengers waiting for the minibus was much more than it could accommodate I knew there would be survival of the fittest and I didn’t like to come to the weaklings group… but Western people can never compete with Subcontinent machos in some feats like hurrying into a bus/train breaking all etiquettes of a queue… so I ended up on some seat while watching a countless passengers in despair from inside the window shield who failed to be successful. We gave a hearty farewell to Mustang and our bus descended along the wild unpaved road with the rhythm of the accompanying river. There was some problem with the engine of the bus which forced the driver to drive extra-cautiously and halt at every turn and that in turn delayed our arrival to Beni to post 8:00 PM. The last bus to Pokhara had left long before, so we had to reserve a taxi like the last time and yea, the driver charged even more. We reached our hotel at Pokhara little before twelve and finished our supper like famine victims. The green minibus was already filled with other trekkers, travelers and hand few local people. 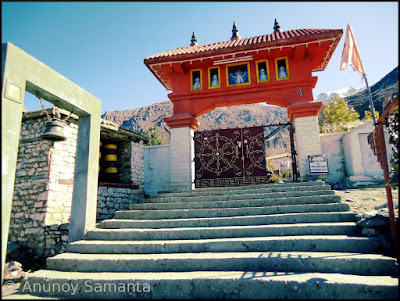 Before ending this travelogue, few more things I would love to add about traveling to Muktinath as Mukinath is a prime destination for a majority of religious tourists too. Travelers willing to submit themselves to physical endurance test can only go there. There are several ways to reach Muktinath. Pokhara is well connected by road and regular flights to Kathmandu which has international airport. Either one can take a flight from Pokhara to Jomsom and then hike for 7-8 hours from Jomsom to reach Muktinath or trek all the way from Pokhara through Kali-Gandaki valley which takes a week approximately. Bus & Jeep Services (shared/reserved) are available from Pokhara to Jomsom via Beni, Ghasa correspondingly where one has to change the vehicle and it takes about 11-14 hours. In the daytime at Jomsom, shared jeep services (depending on passenger availability) are available for Muktinath which takes around 2 hours. Helicopter services are also available from Pokhara & Kathmandu. Actually, there are plenty of ways a traveler can travel, depending on his time and budget… but above all, the devotees believe that one should have the blessing of the Lord to reach to His holy abode. 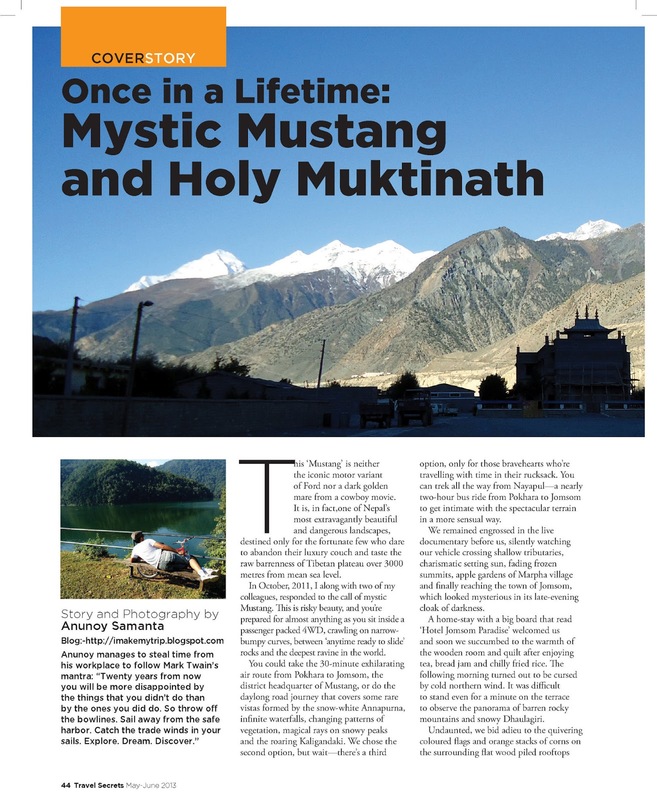 As I mentioned in the introductory post, my Jomsom to Muktinath Trekking Tale had got a place in the cover story section of May-June 2013 issue of Travel Secrets magazine. It always feels good to see your own words published on paper. My warm thanks to the editorial team! I've provided you the scanned pages which you can click to enlarge and read. Always remember to acclimatise before any high altitude trek to avoid being a spoilsport. Like any other remote paradise, Mustang is getting contaminated with rapid urbanization and desynchronized western influence. So, before this place loses her virgin hue, plan your trip to the Annapurna Circuit and take home some priceless memories. Click here to read the Part 1 or Part 2 of this Jomsom to Muktinath Trekking Tale. Your writing is so clear description of people,places,objects and events using an appropriate details which contain sufficient and varied elaborations. Indeed.....!